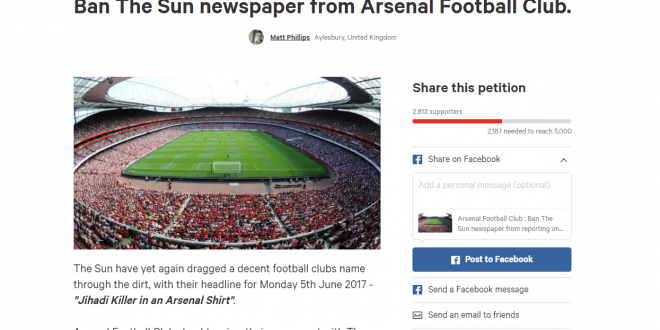 Another petition has been launched aimed at The Sun newspaper, this time as a result of their astonishing “Jihadi Killer in an Arsenal shirt” front page headline. 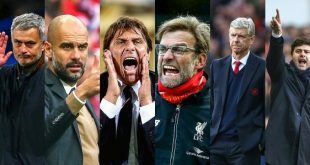 The petition on Change.org is asking the club directors to deny journalists of The Sun newspaper access to their club in the wake of their headline, which also follows upon our own petition that was aiming to get The Sun journalists denied access to every club in the Premier League. At the time of writing there has been nearly 3,000 signatures on the Arsenal FC petition, setup by Arsenal fan Matt Phillips, and many fans of the club on social media have made their voices heard at their anger over these headlines. Some have accused The Sun of doing this simply as a way of getting under the nose of Jeremy Corbyn (a well known Arsenal fan), in a very sly manner. Who knows what their reason, apart from trying to drum up extra publicity and cause just about as much outrage as they can. The Sun have yet again dragged a decent football clubs name through the dirt, with their headline for Monday 5th June 2017 – “Jihadi Killer in an Arsenal Shirt”. Arsenal Football Club should review their agreement with The Sun and have them banned from The Emirates and London Colney. Arsenal Football Club prides itself on its great values and tradition. The Sun does not share these values, and has proved that with its disgusting lies. We don’t like the s*n newspaper. We don’t sell the s*n newspaper. We don’t buy the s*n newspaper. We don’t accept the s*n newspaper. I call on the decent people of North London and anywhere around the country that has had enough of this to stand in solidarity with the people of Merseyside and Manchester. Along with Bristol, Sheffield, Hull, Blackpool, Norwich, Leicester and Rotherham. The S*n has defamed these cities and took great pride in doing so, this can’t continue. Matt is the owner and chief-editor of the Footy Blog, one of the UK's leading football news blogs.